A Free Throw for Muscular Dystrophy | Ridge's Stitches | Health Coach. Yoga. Clothing. It was senior night at The Columbus Academy as Ali Dillon’s brother excitedly approached the free throw line. The crowd anxiously awaited his shot. The basketball went in and the crowd erupted with a standing ovation. As a basketball lover living with a rare form of muscular dystrophy called CPTII Deficiency, he was unable to play throughout the season. He became the team manager and had a wonderful support system from the team. The free throw shot he was able to take on senior night showed how his team and his community truly viewed him as their leader. According to the Muscular Dystrophy Association, “muscular dystrophy, ALS and related muscle-debilitating diseases take away physical strength, independence and life.” There are many forms of these neuromuscular diseases. Her grandmother suffered from ALS and passed away when Dillon was young. Dillon’s younger brother was diagnosed with a lesser form of muscular dystrophy when he was in middle school. This impacted his ability to play sports. However, the strength of their community really lifted his spirits as well as many others suffering from muscular dystrophy. Dillon happened to get involved with muscular dystrophy by chance and later discovered how much of an impact it had on her family. She began volunteering for the MDA Summer Camp at the age of 16 and loved it so much that she continued to go back year after year. 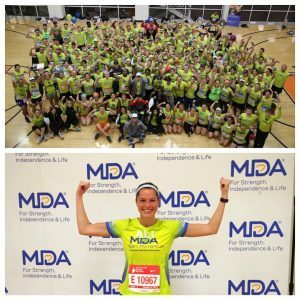 When she moved back to Chicago, she got involved with MDA and specifically Team Momentum. She has now been involved for a decade! “This is an organization that really supports my family despite the fact that I don’t know exactly what they’re going through,” Dillon states. Team Momentum is a running group that celebrates the families and lives of individuals living with muscular dystrophy. 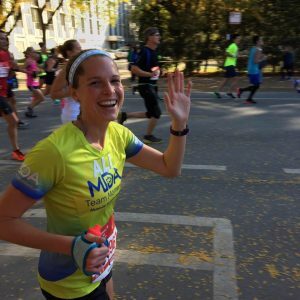 The running group participates in the Chicago Marathon and meets twice a week to run and support each other on their journey. The group has a wide variety of participants. There are even individuals who participate in the race and get pushed in their wheelchair by loving family members! “I never had the experience of running with a team to celebrate people, and Team Momentum does that so well,” she continues. 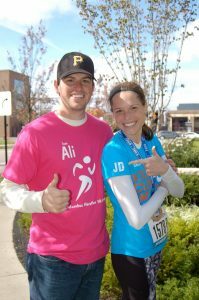 “Rare diseases are overlooked and having a team and support system really helps that,” Dillon says. Team Momentum focuses on celebrating the life experiences rather than dwelling on the hardships. “They are one of us, they are part of this team, they are celebrating themselves and the team they’ve built,” says Dillon about those with muscular dystrophy. Ridge’s Stitches aims to raise awareness for different organizations such as the Muscular Dystrophy Association. Through the month of March, Ridge’s Stitches will be donating seven percent of its profits to MDA. On March 11th, Ridge’s Stitches will be with the running group hosting a recovery yoga class for the runners. Order a stitch today, support MDA!